For several years now I've admired my friend Mike Totman for giving blood on a regular basis; he's been doing so for years and has some amazingly high number of donations. 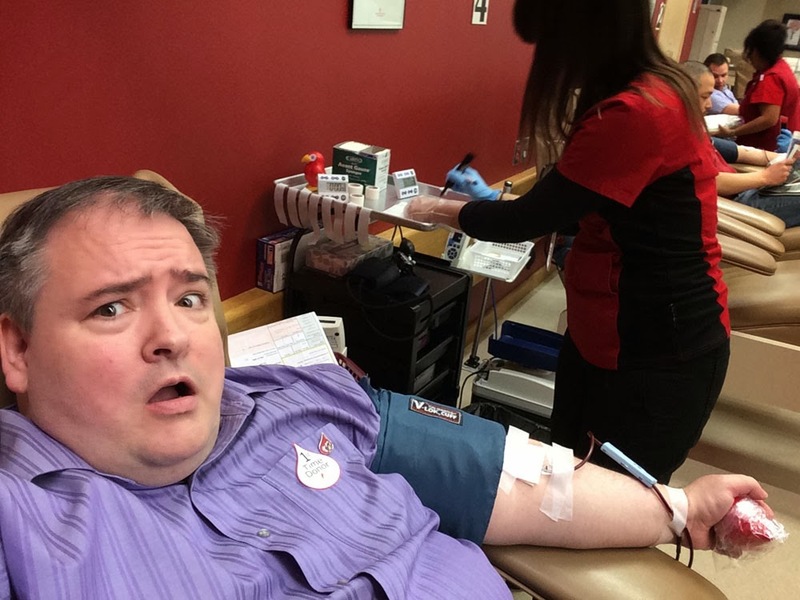 I've often thought about donating blood, but the thought of having it drained always left me feeling a little nauseated. Corporate Challenge and the convenience of donating with a pack of coworkers provided the boost I needed to finally roll up my sleeves. Donating was painless, and I was pleased to exclaim "My blood is coming out!" (It's a line in several of the screenplays I'm working on.) Plus Canadian Blood Services provided snacks and a snazzy lapel pin. It's a little weird, though, seeing your own thick red blood flowing through a tube and steadily filling up what seems like a pretty big bag. It's in you to give. Well done, Earl, welcome to the club. Invite all your friends.